Goodreads: In the middle of the twentieth century, the music of the Mississippi Delta arrived in Chicago, drawing the attention of entrepreneurs like the Chess brothers. Their label, Chess Records, helped shape that music into the Chicago Blues, the soundtrack for a transformative era in American History. Leeba doesn't exactly fit in, but her passion for music and her talented piano playing captures the attention of her neighbor, Leonard Chess, who offers her a job at his new record company. What begins as answering phones and filing becomes much more as Leeba comes into her own as a songwriter and befriends performers like Muddy Waters, Howlin Wolf, Chuck Berry, and Etta James. But she also finds love with a black blues guitarist named Red Dupree. With their relationship unwelcome in segregated Chicago and shunned by Leeba's Orthodox Jewish family, she and Red soon find themselves in the middle of the Civil Rights Movement and they discover that, in times of struggle, music can bring people together. Kritters Thoughts: What an epic story, but it doesn't span too much time, but it feels like it - in a good way! Leeba is a young jewish girl living in Chicago, IL and hasn't quite found what she wants to be doing for the long term. At the same time a talented guitarist moves up from the south to Chicago to hopefully make it big. It is the 1950s and their friendship is somewhat welcome in Chicago, but definitely not where he came from and in this time, the music scene globally is changing. I love historical fiction and usually the historical fiction that I read is REALLY historical, so only going back 60 years is kind of fun and different. I also loved the focus on the evolution of music - I am far from musically talented but I love learning about how the times of history can affect the social times. One of the reasons I love reading historical fiction is the opportunity to learn something without feeling like you are learning something! Another thing I love about reading historical fiction is when it makes me look up online things or people in the book. I was all over google and youtube looking up videos and things about the musicians in this book and how record labels were changing and evolving at the time. My favorite was listening to the music and really feeling how much of a change this music would make on peoples lives - such a fun way to read a book. 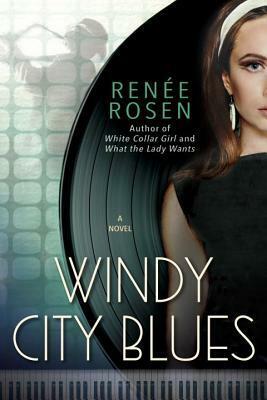 I have one of Renee Rosen's back list books on my wish to read list and after reading this book it will be jumping up a few notches - White Collar Girl may be read very soon!